Tomorrow is the first day of school...and I'm not thrilled lol. It's so hard for us teachers to get back into the swing of things after having a 10-week vacation. I will miss my relaxing days by the pool, vacationing and running around with mom, and of course sleeping in. But, with the new year comes exciting changes, new kids, and of course routine, which I love. Wish me luck for great kids and a fun first day! 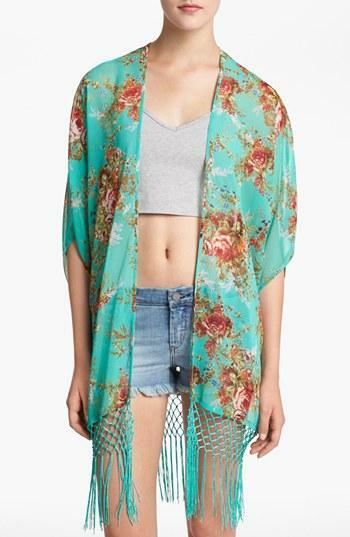 I'm thinking tomorrow might be the perfect day to wear my new kimono. 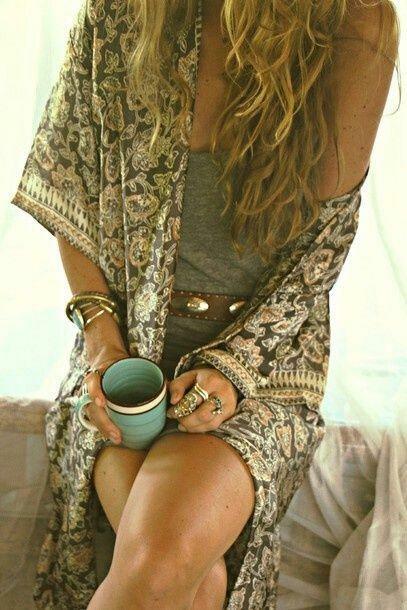 What's a kimono, you ask? Well, according to Wikipedia (not the best source lol), a kimono is: "a Japanese traditional garment worn by men, women, and children. The word 'Kimono,' which literally means 'something to wear,' are T-shaped, straight-lined robes, worn so that the hem can fall to the ankles." They are very traditional, but are of course being modified for American style. Here are a few of my favorites right now. And, here's my new one, courtesy of Nordstrom! I love it! Where did you get the pic for the second one(with the coffee cup)? It's beautiful.